"Holly" is engraved on a sign hanging around this resin sheep's neck. The sign has holly around it. 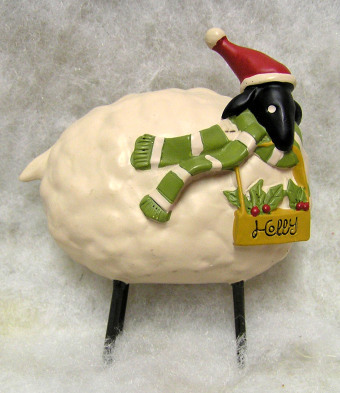 This black faced sheep has a snow hat and scarf and thick wire legs. 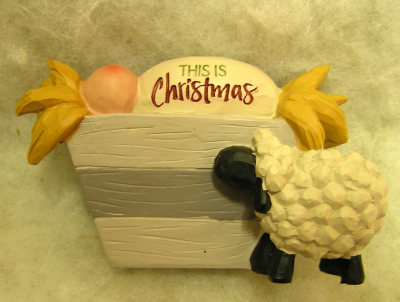 "THIS IS CHRISTMAS" is engraved on the blanket surrounding Jesus in the manger in this resin item. There is a little sheep standing by the manger watching the sleeping baby. This measures 2 3/4 x 4 1/2 x 2 1/2. 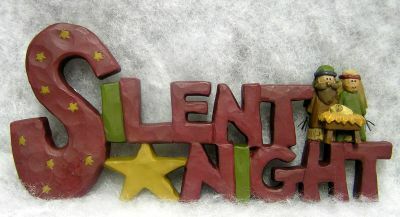 "Silent" is spelled out on this resin item. 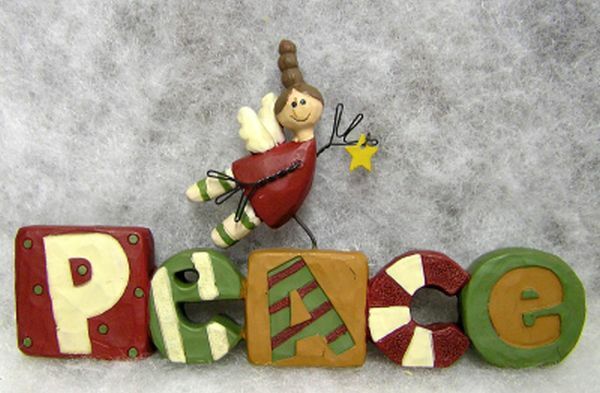 There is a manger with Mary sitting on top of the letters. This measures 2 1/2 x 7 x 1. "SILENT NIGHT" letters are the base of this resin sign. It also has a star and Mary, Joseph, and a manger. 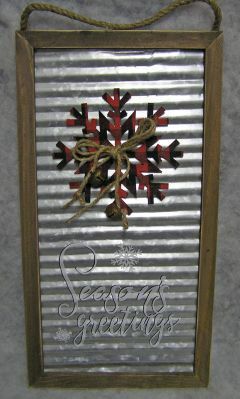 Another unique item from Manchester Cottage, this wooden block has a bowl with greens and berries painted on it. The bowl says "PEACE" on the front and has a candle in it. 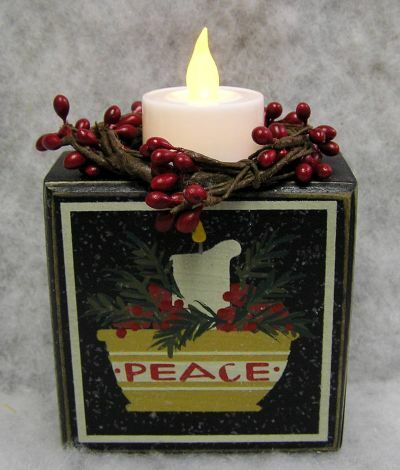 There is a red berry wreath on top with a votive light. It measures 5 x 3 1/2 x 2. 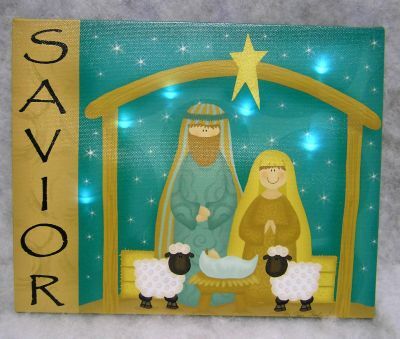 These canvas nativity signs come in two styles: "REJOICE" and "JESUS". 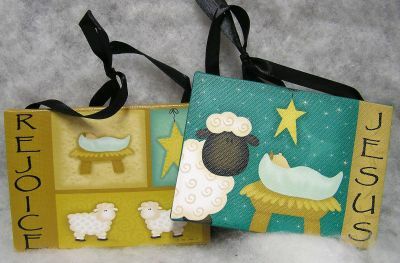 There are sheep, the manger and a star on them and they have a black ribbon hanger. They measure 4 x 5 1/2 x 1/2 + hanger. "Believe in the season" is printed on this canvas sign. It also has a cardinal, poinsettias, and holly. 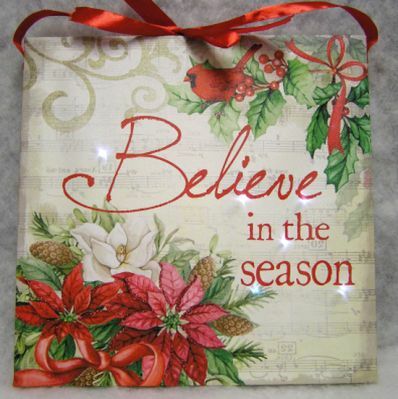 There are multiple lights that shine through the canvas and a ribbon hanger. The lights can be turned off and on and use 2 AA batteries (which are included). It measures 10 1/2 x 10 1/2 x 1. Bright lights are featured in the background of this snowy scene. 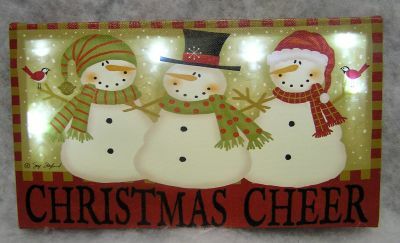 It is a canvas print that has three happy snowmen with hats, scarves, and little birds. It says "CHRISMAS CHEER" along the bottom. The lights use 2 AA batteries. It measures 6 x 11 x 1. 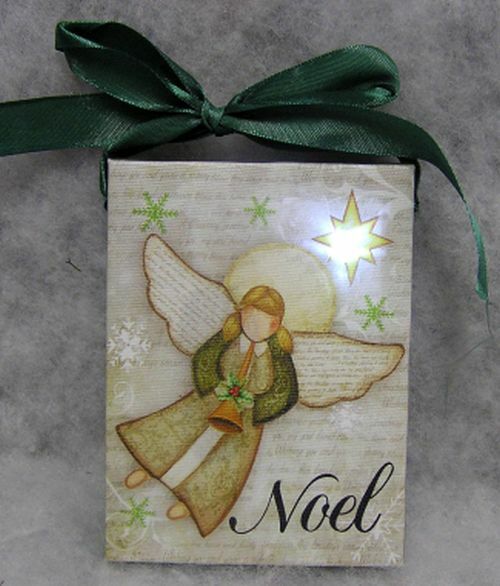 An angel with wings, snowflakes, and a star are printed on this lighted canvas sign. 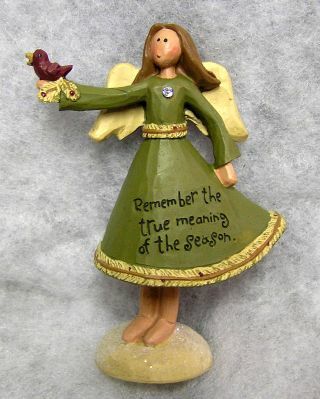 There is a light behind the star that shines through the canvas and it has a green ribbon hanger. The light can be turned off and on and uses 2 AA batteries (which are included). It measures 5 c 3 1/2 x 1 + hanger. 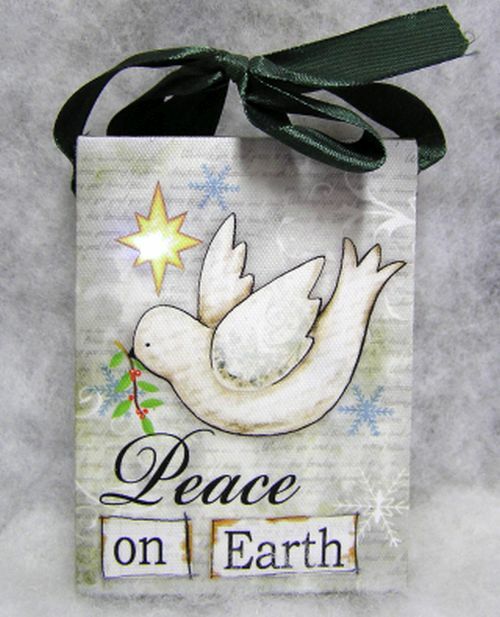 "Peace on Earth" is printed on this lighted canvas sign along with a dove, snowflakes, and a star. There is a light behind the star that shines through the canvas. The light can be turned off and on and uses 2 AA batteries (which are included). It measures 5 x 3 1/2 x 1. 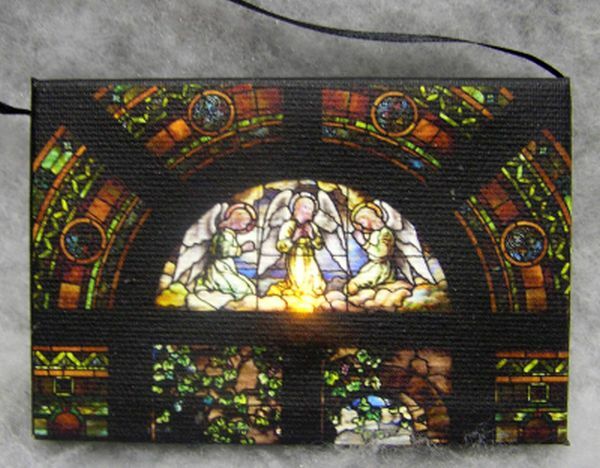 A stain glass window is the inspiration behind this canvas print. It has three angels in the center that are lighted using 2 AA batteries and a black ribbon hanger. It measures 3 1/2 x 5 x 1.